Lightweight, 100% leakproof manholes & sumps for easy installation in difficult sites. Fibreglass manholes and sumps are factory made in all fibreglass construction ready to be placed directly into the ground. The units are factory assembled, with inlets and outlets where possible. Standard units have a minimum stiffness of SN5000. They are designed for ground water table at the surface, and to use native soil as backfill. They have an indefinite life in this service, and will easily outperform the 50 year life required for municipal infrastructure. Vinyl ester FRP manholes have proven performance in dairy and food industry CIP wastes and can handle large pH and temperature fluctuations. Also ideal for other industrial wastes and municipal sewage. Lightweight, easy to transport, lift and install. Installation is fast. There are no riser joints to mortar together. There is no anti-corrosion coating to be applied. The top of the manhole can be to styled with a riser to suit a standard concrete manhole lid; the fibreglass riser is site cut to the required height. Other tops include a substantial fibreglass flange onto which a standard concrete manhole lid is placed. A concrete manhole cover is usually placed over the top of the manhole, and enables superimposed loads to be applied. 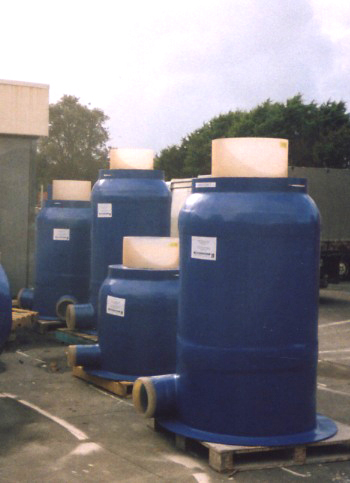 Special designs are available to suit specific loadings or site conditions. Jointing to other pipe materials is handled case on case. Armatec can manufacture specific fittings to your exact specifications to suit. For example, a matching collar and spigot can be fitted to joint to concrete or ceramic pipes. Flanges can be fitted if your pipes are flanged. Flexible couplings are popular, and Armatec then manufactures the OD of the manhole stub to match the OD of the joining pipe. Anchor blocks may be required on pipelines, to ensure that there are no expansion or contraction forces applied to the joint at the manhole. Anchor blocks are often a puddle flange around the pipe, around which concrete is poured. Armatec can supply a short length of fibreglass pipe complete with puddle flange as required. 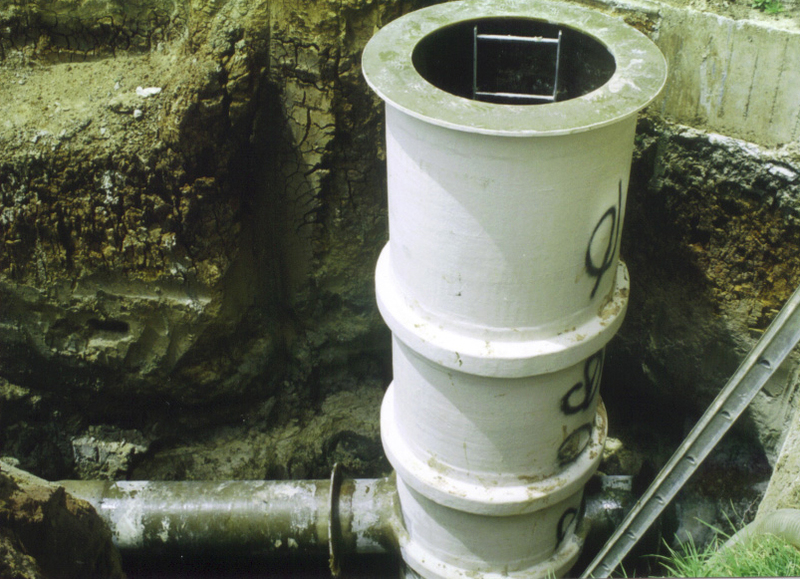 The base of the manhole for trade waste sewers includes a 200 to 300 mm deep sump. The water in this sump acts as a buffer for large temperature and chemical concentrations, typical of trade waste sewers. The sump also acts as a trap for stones, tools and other sharp objects. The base for municipal sewer manholes is self draining, and needs to be because of the human solids handled. The haunching is done in factory to the required specifications. Ladders can be fitted as required. Some Councils specify ladders, other Councils specify there shall be no ladders. Other equipment is easily fitted in factory as required. This minimises on site costs and confined space entry. Health and safety procedures must be followed whenever entering a manhole on a sewer. Hydrogen sulphide gas and oxygen depravation can kill. Do not enter a manhole without the proper safety training, the right equipment, and supervision. A lightweight fibreglass Armatec manhole replaced a badly corroded and leaking 100 year old concrete manhole in Devonport, Auckland.